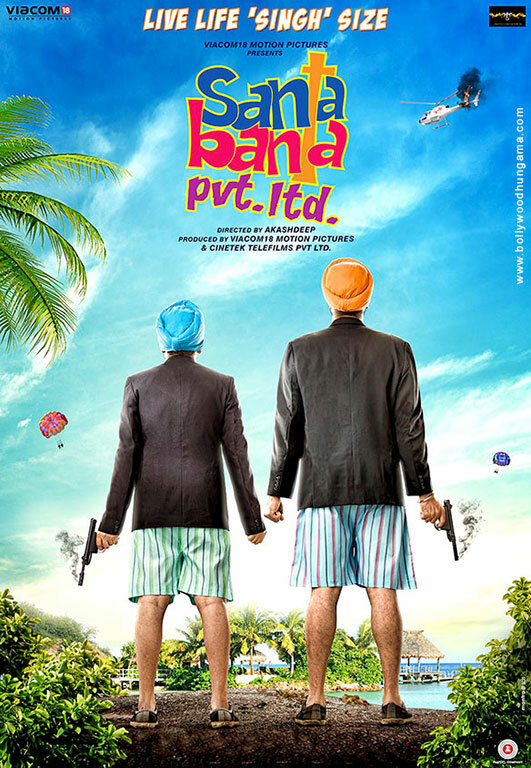 You expect a fun soundtrack for Santa Banta Pvt. Ltd., considering the genre that it boasts of as well as the comic cast [Boman Irani, Vir Das] that it has. However, with near to negligible promotion going for it, one isn't sure how far would music by composers Jaidev Kumar, Milind Gaba and Jassi Katyal actually travel. Remember 'Machli Jal Ki Rani Hai', the childhood poem from a couple of decades back? Well, it is brought back in Santa Banta Pvt. Ltd. by lyricist Kumaar, and this time around it features literally (as a fish waiting to be eaten) and figuratively (a girl waiting to be trapped). Unfortunately, this Jaidev Kumar composition doesn't impress in either of the two versions despite Sonu Nigam leading the charge and Vikas Bhalla joining him as a singer. Newcomer Akira steps into the fold with 'Ishq Karle Anytime' and this time around the results are better, what with composer Milind Gaba lending good pace to the proceedings. Though Kumaar's lyricists are nothing great to write home about, they do well for the situation where the need is to bring on a peppy outing. Moreover, Sonu Nigam and Mika Singh are just the right singers here to keep the energy going. 'I want to be 'sharaabi' tonight' - This is the opening line for 'Hit Kardi' which is put to tune by Jassi Katyal. With a Punjabi base to it, this is yet another track rendered by Sonu Nigam and this time around he is joined by Punjabi superstar singer/actor Diljit Dosanjh. Kumaar is in good form and though the lyrics don't take a poetic route, they do well for the situation. If promoted well, it could have covered the distance. By the time the fourth song arrives, you do arrive that Santa Banta Pvt. Ltd. is one of those rare soundtracks to have each of its five songs rendered by Sonu Nigam. This time around he goes solo for the title song 'Lo Aa Gaye Santa Banta' and modulates his voice to a good extent. The tune though is just all over the place and fails to hold your attention. Even though pitched as a dance number, this one fails. On the same lines as 'Hit Kardi' arrives 'Tooti Boldi' which has Sonu Nigam, Mika Singh and Dolly Sandhu coming together for lyricist Kumaar and composer Jassi Katyal. This one too has a pace similar to that of 'Hit Kardi' and you do not mind the four minutes that follow as there is no let down in pace while the singers bring on good energy as well. The soundtrack could have covered some distance if accompanied by some promotion and awareness.